Taking time at first to look for a refrigerator repair New York City Company can help you a great deal. Paying close attention to the functioning of your home appliance can assist a lot in identifying the underlying problem at the first stage only. Relying on professional service can make your life easier. A refrigerator is a necessary and useful appliance in every home, hotel, office, restaurant, and hospital. It has many uses and must run continuously, night and day, to keep things inside cold and fresh. It is vital that the refrigerator gets regular checkup and maintenance to ensure that it stays functional for a long time. There are signs with which you can determine that your fridge needs repair. Sometimes it may start to make a strange and off sound, or the appliance may begin to leak. If you experience these issues, you must look for a New York Appliance repair company expert in refrigerator repair service. It is essential to know the level of issue with your appliance before calling up a technician, as some problems can be repaired easily at home. However, if the problem is complicated or is of a higher degree that needs expertise, then taking professional help is a smart choice? Checking minor details on your own can help you save a considerable amount of money on repair. There are lots of companies out there that offer New York refrigerator repair. So, you have to be very careful about choosing a service provider who can help you in need. There are certified and authorized service providers in New York who can help you in repairing your fridge regardless of make and model. When looking for a company that offers refrigerator repair in New York City, some factors need to be considered. A professional with the required skills and expertise is the prime consideration. The repair service provider must be skilled in dealing with all types of issues with a fridge. Some other essential factors like customer service, trustworthiness, prices as well as availability should also be considered. What to Look for in a New York Refrigerator Service? Considering the importance of this home appliance in everyday living, it’s vital that the New York refrigerator repair service is available even after regular business hours. This is to ensure that if the unit malfunctions at odd hours, it can be attended and fixed on time. 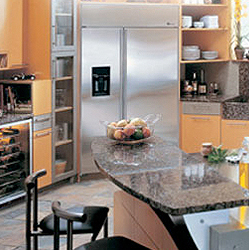 Refrigerator repair needs expertise and technical knowledge. The service you hire must have experts who are experienced and qualified. They must have the skill of fixing the unit of all models and brands. The professional attending the fridge should have all the essential tools and equipment to let him finish the job then and there. The repairmen must be well-equipped and able to finish the job within the premises of the homeowners. The technicians of the appliance repair company should only utilize genuine spare parts. Choose a New York refrigerator repair service which ensures that your unit works correctly and efficiently and provides utmost customer satisfaction. This entry was posted in Appliance Repair NYC Westchester Bronx, Refrigerator repair and tagged new york appliance repair, refrigerator repair new york city, york refrigerator repair. Bookmark the permalink.